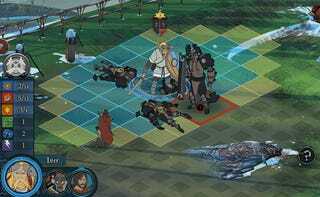 It feels like it's taken forever - and if you've been stuck playing the game's multiplayer component, out since last year, that's especially the case - but The Banner Saga is actually out today. And true to form, it looks incredible. I've been messing around with a finished build of the game for a little while now, testing out the much larger and more involved singleplayer campaign, and have found that for a studio with such a strong art pedigree, the game's...art sure is pretty. OK, so we knew that already, but it's really the thing that stays with you about The Banner Saga. The gorgeous hand-drawn art floors you throughout the entire experience; not just in the slightly-animated cutscenes, but even in things as mundane as glorified options screens, which in other games would probably be a lifeless static screen, but which in The Banner Saga come to life with gentle weather effects and a snuggly (given the bleak snowy setting) climate. The highlight though might be the fully-animated sequences at key points, which look like HD remasters of that classic 70s style seen in flicks like Lord of the Rings. The game, though, well. It works. I actually dig the meat-and-potatoes of the experience, turn-based combat that'll be familiar to anyone who's played games like Fire Emblem or Final Fantasy Tactics. Players take turns to make a move or attack, you attack for points, there are special moves. You also get control over unit progression, levelling everyone up as you go. Where The Banner Saga tries something new is in the way your health points degrade. Developers Stoic have tied your health to your attack; the more damage you take, the weaker your attacks will be. This works in reverse too when you're the one doing the attacking, enemies taking bigger hits the weaker they get. This takes a little getting used to, as the "tipping point" of battles can come a little sooner than you're expecting, as units that appear to have a little fight left in them are instead scythed down quickly by stronger opponents. I like it though. Not only is it a little more realistic (relatively), but it makes you more cautious with your wounded units and more aggressive against a faltering foe. This can help change the tone of a battle quite dramatically, shift gears when it otherwise might have gotten a little stale. What I didn't like was everything tying those battles together. The Banner Saga has a fairly linear campaign with a surprisingly lengthy story, the majority of which is presented via static cutscenes. And it's...dull. I'm normally the last guy to go skipping a game's narrative - it's one of my favourite things about singleplayer experiences - but in this case a combination of lore overload and some average voice acting had me flying past dialogue as fast as I could click. There's also a basic resource management system geared around keeping everyone happy and fed that aims to flesh out your progression in the campaign, but which is mostly tedious and comes across as a half-baked implementation. It's a shame about that this extra effort falls flat, especially the story, since you can tell a lot of work has gone into it. Things might simply have run more smoothly, and been more enjoyable, without the enforced interludes between battles. You might think continually going on about the game's art is superficial, and it is, but that doesn't make it any less important. I've been playing this game in various guises for almost a year now, and I still just leave it running sometimes, hand off the mouse, watching things as simple as a unit's idling animations. And while the fluff in the middle mightn't have worked, the core at the other end of the game - the battles - certainly do, some fresh ideas meeting tried-and-tested genre staples to provide an experience that's flexible enough to remain fresh throughout the game, no matter the size or style of battle. The Banner Saga's available for $20 on Steam.